Radish is an underdog. He's the guy you call when you need a colorful last-minute salad upgrade. But he can hold his own when the temperature heats up and the stakes are high. 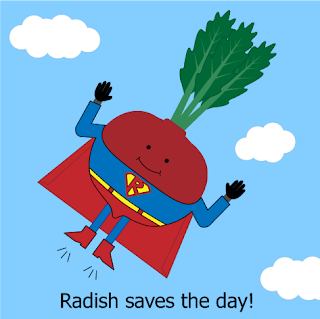 Radish has super powers. P.S. Kids, eat your radish greens! P.P.S. The inspiration for today's comic comes from the lovely @radishpower. Question: Are radishes and beets cousins? Response: Despite the uncanny resemblance between Radish and Beet, they are not cousins. Lesser known fact: Radish and Cabbage are cousins while Beet and Chard are cousins. your site is THE CUTEST. @radishpower, let's make this happen! Mmm I love radishes! They are great sliced in salads or on tacos. I recently had black radishes for the first time, which taste like a cross between red radishes and turnips. Delicious. Thanks for the idea, Katherine!